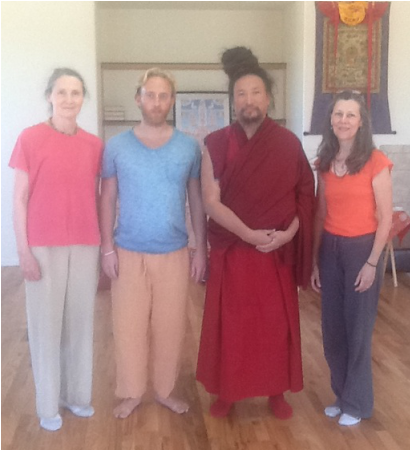 October 2014: Venerable Drupon Rinchen Dorjee Rinpoche, with new three-year retreatants Cathy Nelson (doing her second three years), Carol Bailey, and Kevin Miller enjoying their beautiful new 3-year retreat temple at Garchen Buddhist Institute. H.E. Garchen Rinpoche has said that one of the most meritorious ways to help support 3-year retreatants is contributing to their food fund, and if you would like to help in this way, please email GBI at questions@garchen.net or give a call at 928-925-1237. Your prayers for auspiciousness for their retreat is another powerful way to support them.